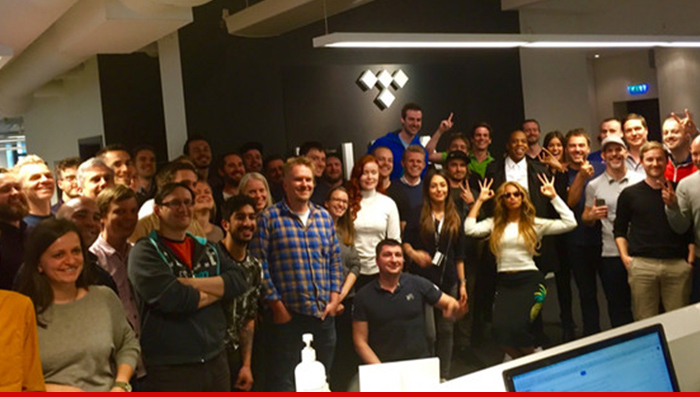 Jay Z's office photo at Tidal is kinda like playing Where's Black Waldo? -- and Jay Z is Waldo. The pic popped up on Beyonce's website this week, and shows Jay and Bey mugging with a few dozen staffers at the HQ for the streaming service -- and the ONLY black people in the pic are the owners. On the surface, this seems like something to celebrate. Progress and stuff, right? Problem is, Jay played the race card a few weeks ago, when he called out the black community for not backing his company... the way it supports Apple, Nike and Google. - "Jay tried to guilt trip us ... but his staff are all white"
- "Jay does a 'Pro-Black' freestyle but then releases a picture of #Tidal's all White staff." - "Those who complain of no blacks in white owned institutions. Well here u go Jay Z OWNS TIDAL. U going to protest?" -"Jay ain't hiring u n***as"
Keep in mind, the Tidal office is in Norway -- where the black population is around 2%. Sooo ... what's a black mogul to do?